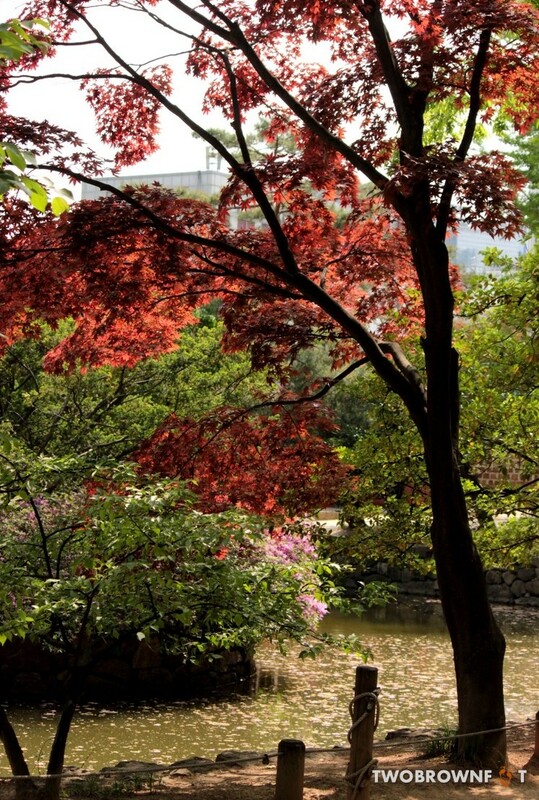 Summer brings in a new phase of festivities in Seoul and the rest of the country. From tea tasting at Boseong Green Tea Festival to elaborate reenactments of royal life; there’s a lot take in. It’s probably, a good time for tourists to visit with the weather being moderately warm; never mind an occasional shower. 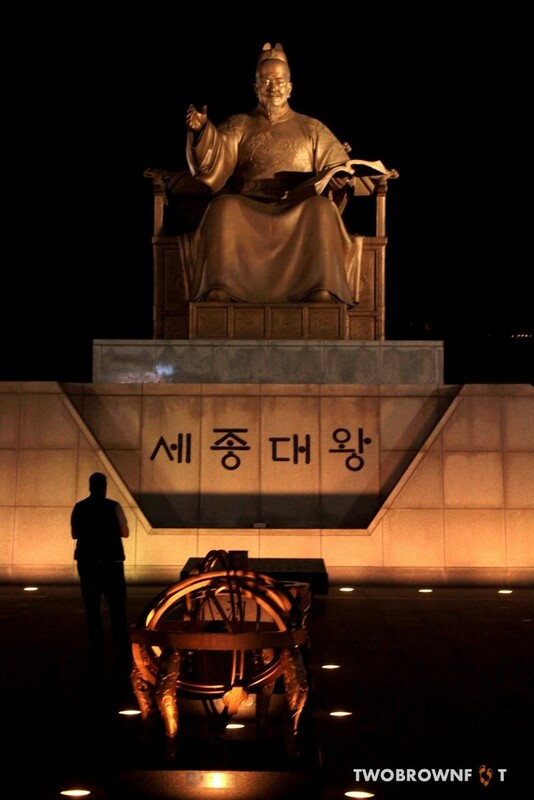 The last week of April also kickstarts the Royal Culture Festival in all four palaces and Jongmyo Shrine. Honestly, it will be difficult to be omnipresent and with only a weekend to spare; we had a tough choice to make. 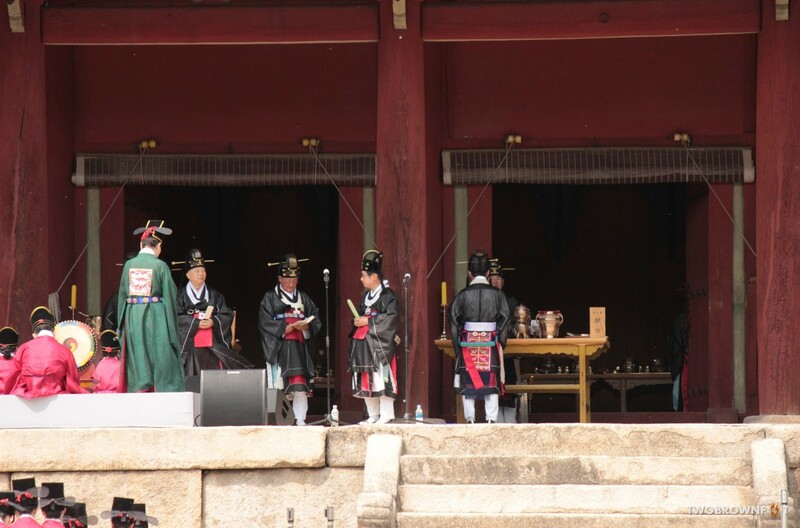 Jongmyo Jeyre (or Daeje) is an ancient memorial ceremony, held in Jongmyo Shrine, in honour of deceased royals. The ancient rites, are performed, in accordance with Confucian traditions and were briefly stopped during the Japanese invasion. Once resumed, there rituals aimed to preserve the traditions carried over centuries, earning them a well deserved spot in the UNESCO Masterpiece of the Oral and Intangible Heritage of Humanity List. In modern times, the first Sunday of May is the chosen day for performing the ceremonial rites. 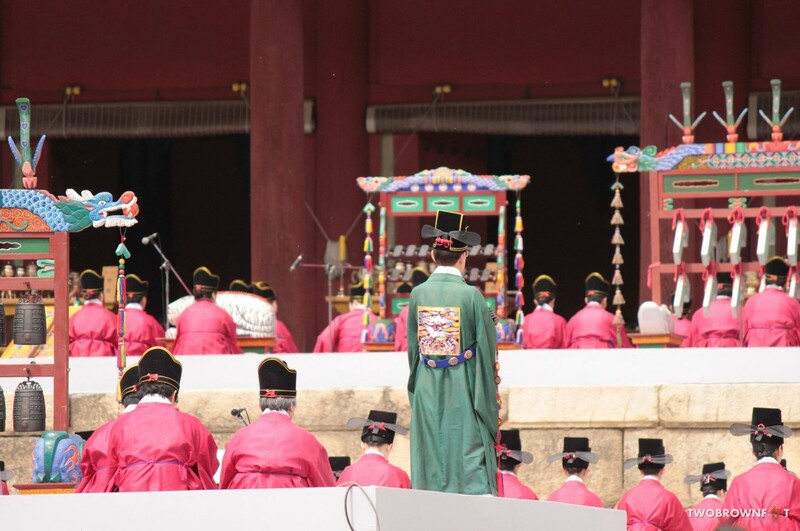 The key to getting a vantage view of an ancient ceremony, is to start from your apartment, at least two hours earlier. This basic travel tenet applies anywhere in the world and seasoned travellers aren’t exempt from this rule. In some cases, you could like to add an hour extra, just to get a chair. We knew we would never make it for the ceremony, at 10 am, on a Sunday morning. 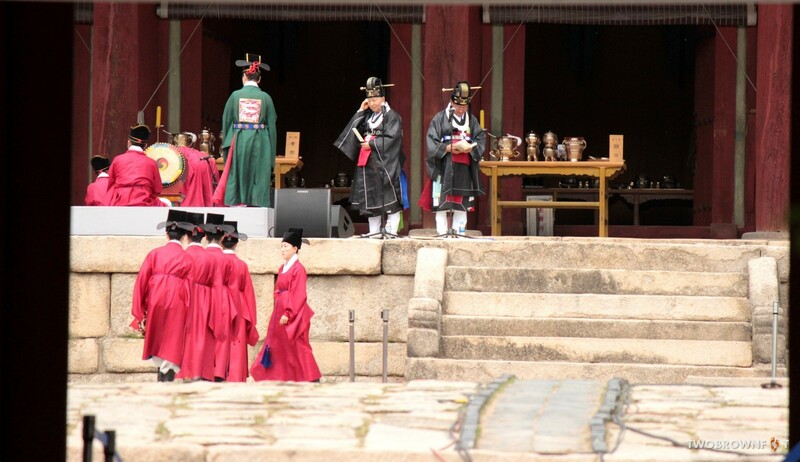 Fortunately, the ceremony at the Jeongjeon would begin at 2 pm. 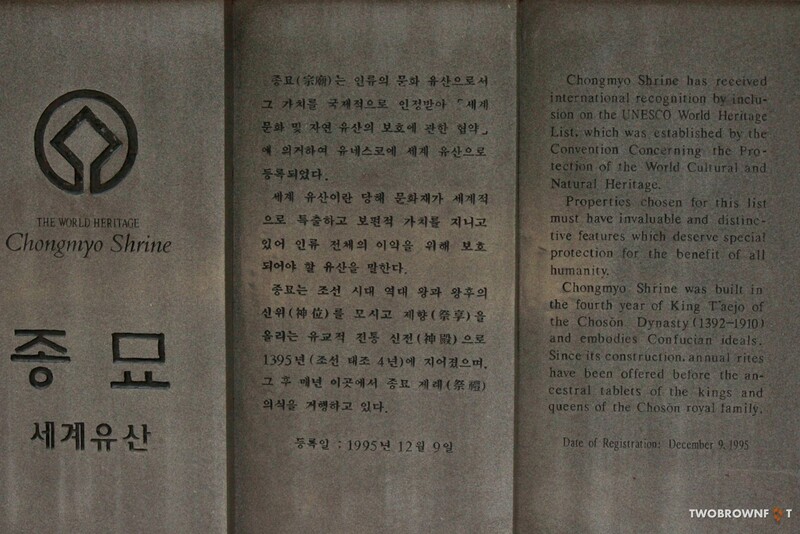 We reached Jongmyo Shrine at 1:15 pm and hurried towards the ceremonial hall, only to be redirected towards a queue that seemed to grow, with every step we took in its direction. In 15 minutes, the local coordinator advised people standing in the line, to watch the ceremony near the LED screen. There were no English translations for foreigners, so we asked a young boy behind us for a translation. He said, we’d be extremely lucky to get a seat inside and might want to consider grabbing a seat near the screen. It seemed tempting, considering it was hot, and we hadn’t eaten our lunch. But we stayed put; just as he did. In hindsight, it was not such a bad thought. Unfortunately, we didn’t get to enter the main ceremonial hall, but were close enough to peek inside. At 6 ft, Basil was at an obvious advantage. Add an arm’s length and the result is what you see above. I, on the other hand, was on my toes — trying to peer between — a sea of bobbing heads. 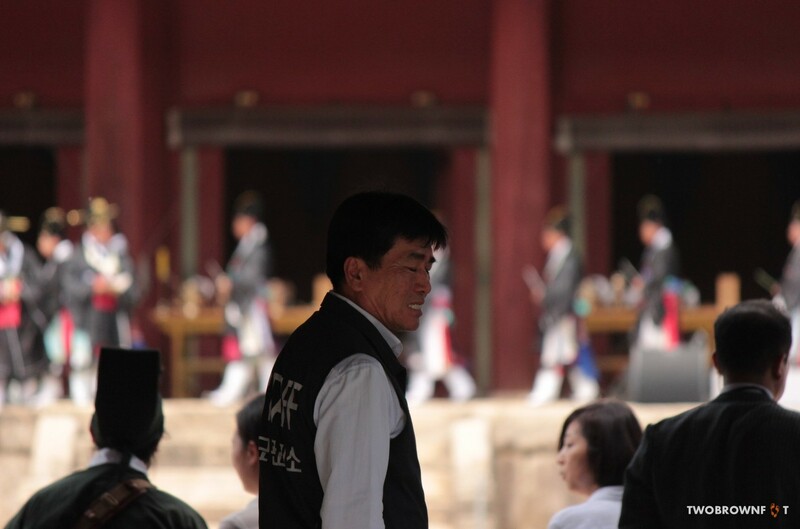 Gyeongbokgung Palace along with the three other palaces and Jongmyo Shrine, had multiple events scheduled on different days of the week. 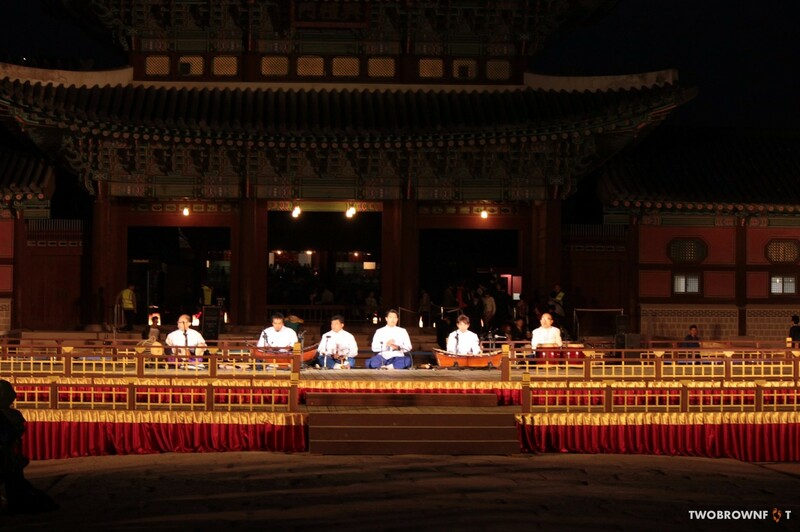 The evening event (weekend) was held in the open space in front of Heungnyemun Gate. Three countries would showcase royal court music and dance performances — over a period of a week. The invited international royal court performances, for the day, included dance and music performances from the Chakri Dynasty (Thailand). Once again, we were late and reached the venue after the announcements were over. 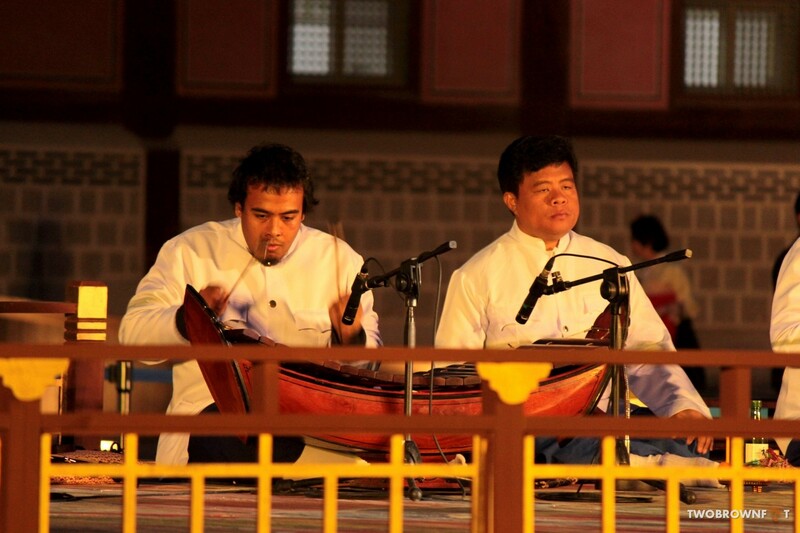 Although the performance were hard to follow or truly understand; it was spellbinding enough to keep us glued. The dance recital was followed by a short musical performance. After the musical recital, the actors/dancers quickly changed into in a fresh pair of costumes — to complete their final act. Once again, it was hard to understand their performance, without having a clear understanding, of the language spoken. 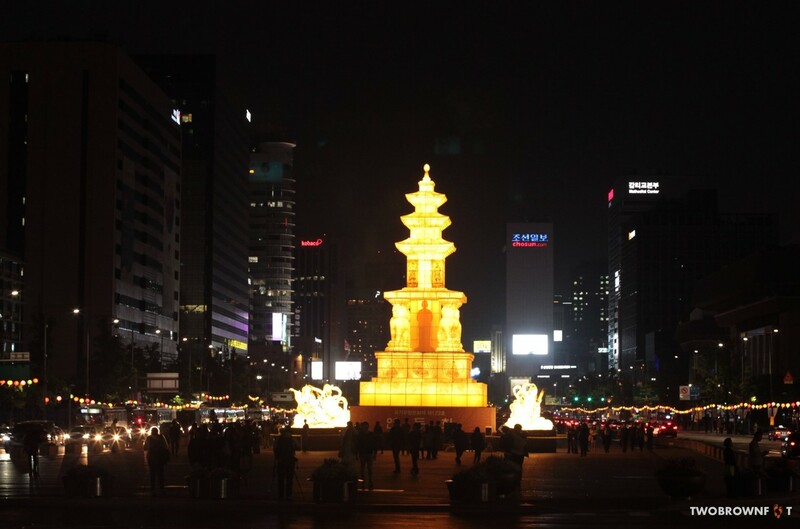 In preparation for the Lotus Lantern Festival (to celebrate Buddha’s birth), a three storied pagoda lantern was lit up opposite Gyeongbokgung Palace. The towering lantern pagoda, at 18m, takes four months to complete and involves techniques used in traditional Korean lantern making. Made from traditional Korean paper, the pagoda is inspired by the stone pagoda at Hwaeomsa Temple. Four lions, at four pillars, stand guard and are symbolic of the tenacity of lions and their courage — guarding core Buddhist beliefs. At the base of the lantern pagoda, four fairies are shown playing musical instruments, as an offering to Buddha. 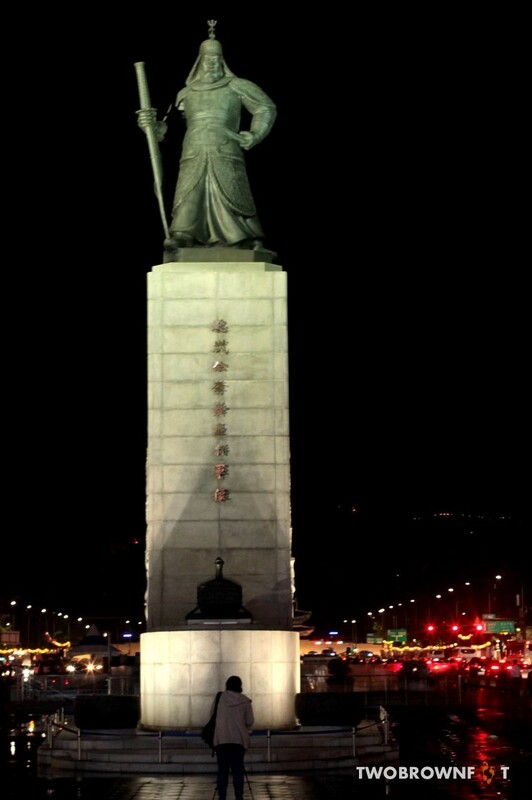 As we walked back to the subway, across Gwanghwamun Square, and leaving behind the palace, it was hard to miss the towering statues of King Sejong (the founder of Hangeul, the Korean alphabet) and Admiral Yi Sun-Sin (a gallant naval commander credited with multiple victories over the Japanese, in the 16th century). And sometimes, war and peace follow one another. 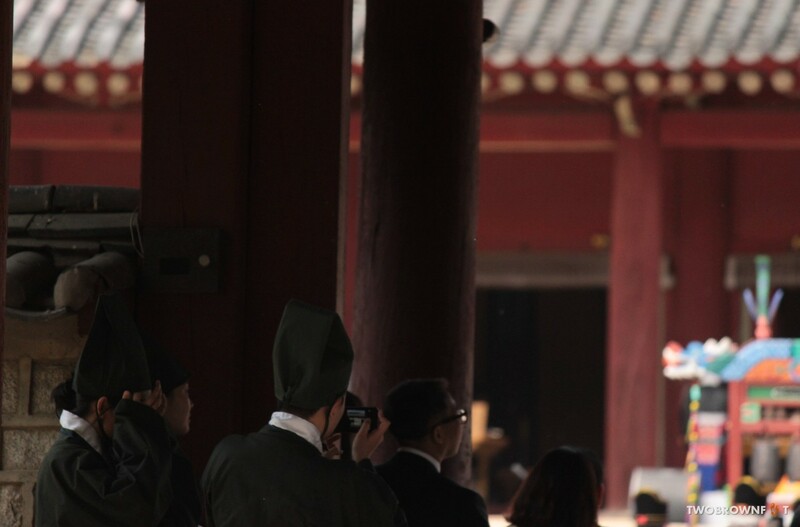 Walking away from the lantern pagoda towards a gallant naval commander; nothing could seem more contradictory. What a fascinating set of photos ~ action shots (which I love) combined with these panoramic shots that have and hold a feeling of history. The sense of history and achievement fills this post, great writing along with your shots. 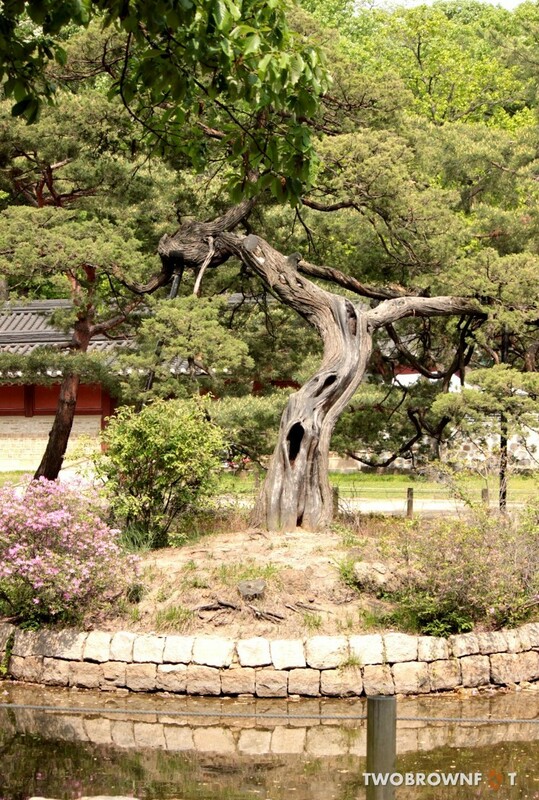 Makes me long to take a trip to see the Jongmyo Shrine. Wish you a great weekend ahead! Absolutely fascinating. I loved learning about the cultural traditions and festivals. And great photos as usual, they really transported me there. Great photos. Looks like a great experience. What a fabulous experience you had…just lovely. What a great post. I really enjoyed reading it. I’ve always wanted to go to a tea festival. Thanks, Kim! 🙂 That’s fantastic and I’ll definitely check out your post.